This model is available as an automated tutorial by selecting Model Examples and Tutorials... > Structural Mechanics > Cantilever Beam from the File menu. Or alternatively, follow the step-by-step instructions below. Select the Euler-Bernoulli Beam physics mode from the Select Physics drop-down menu. First define a line geometry with length 2 and a grid for the simulation. Enter 2 into the Line geometry maximum x-coordinate edit field. Press the Refine Toolbar button. Enter 1 into the Density edit field. Enter 6 into the Cross section area edit field. 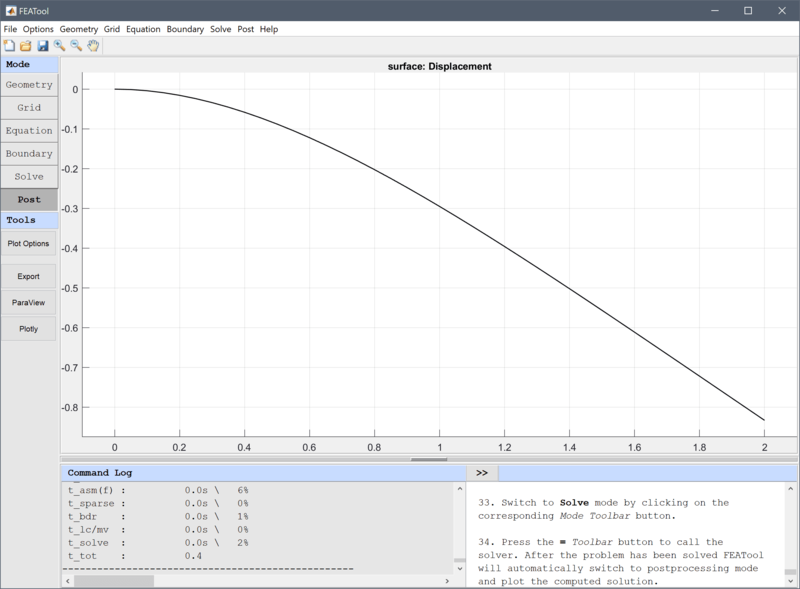 Enter 3 into the Modulus of elasticity edit field. Enter 4 into the Cross section moment of intertia edit field. Set up the point load on the right boundary. Select the Fixed displacement radio button. Enter -5 into the Displacement/load edit field. Verify that the maximum deflection at the end is equal to the analytical solution for a cantilever beam with a point load PL2/(3EI) = -1.1111. Enter 2 into the Evaluation coordinates in x-direction edit field. Go back to Equation mode to define a uniform load, and remove the point boundary condition load. Enter -5 into the Distributed load/force edit field. Enter 0 into the Displacement/load edit field. Verify that the maximum deflection at the end is equal to the analytical solution for a cantilever beam with a uniformly distributed load q*L4/(8EI) = -0.8333. To conduct a eigenmode analysis, change to the corresponding solver in the Solver Settings dialog box. Verify that the frequencies of the four first vibration modes are close to the reference frequencies 0.198, 1.24, 3.472, and 6.803 Hz. Select 1.54438 (0.197786 Hz) from the Available solutions/eigenvalues (frequencies) drop-down menu. The cantilever beam structural mechanics model has now been completed and can be saved as a binary (.fea) model file, or exported as a programmable MATLAB m-script text file, or GUI script (.fes) file.